I walk Aggie a lot. Which is a new thing for me because when I lived at South Turkey Creek, the dogs lived outside. Except Platypus, who got to live inside and sleep on the bed. Here’s Platy dog. Look at that face. Who can say no to that face? Still, Platy dog is a country dog. She’d be lost in town. My country dogs, named in order, were Fruit Loops, Big Dog, Platypus and the last to join the family, Bear, were pets in the pet-ish (not to be confused with fetish) sort of way. They came around for their food. They sometimes wanted you to play with or pet them. They always wanted to accompany me on my walks, but I never used a leash. They preferred sleeping outside, and Big Dog only came into the house when she was in her final days (a sad time for all). At night, if the dogs were inside, they were tossed outside. They were all moochers, so first chore when setting the dinner table was to put the dogs outside. When we were out of town, a neighbor feed them, and checked on them. There was none of this fancy boarding stuff. 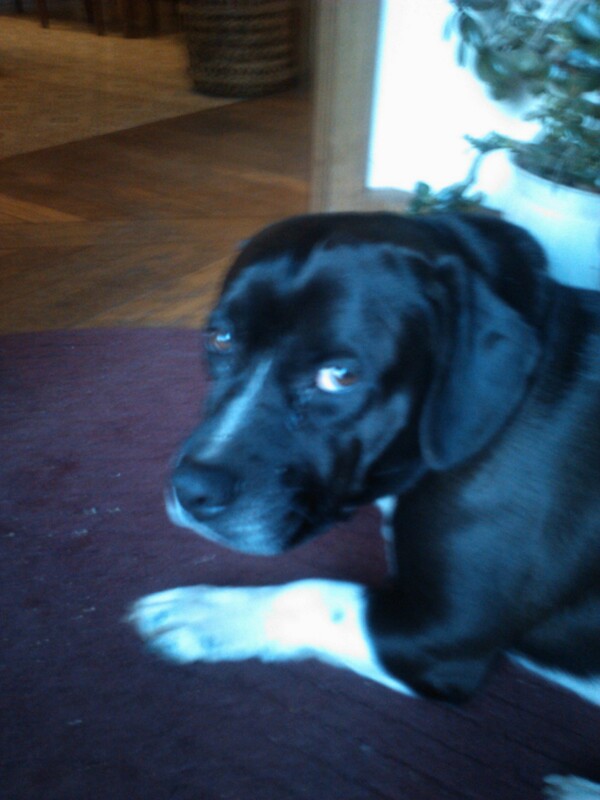 But mostly, the country dogs roamed through creeks and woods, and did a lot of sleeping under the porch. It was their world and they decided how their days were spent (mostly). Its a different life for the City Dog. Agapanthus, Aggie for short, sleeps in a crate (almost the size of a small room). She is always on a leash. Even when she goes out to pee. She is walked four times a day, and if it isn’t a busy day or it isn’t raining, she goes to the Flower Market at night when it is all locked up with no customers, and romps around sans leash for an hour or so. She travels in the car quite a bit. She gets excited when she realizes she is taking the short trip with me to Ingles, my local grocery store. An outing for her is truly an outing. It means not being inside a crate, inside a room, inside a house. For about a week, I was taking Aggie to a very large, enclosed playground at the local elementary school. I can’t brag about the playground. Its just mostly a big open area, but Aggie adored it. She could run from fence to fence, jumping over small rocks, stumps or railroad ties, and actually feel free for an hour. I’d unleash her, and say, “Run Aggie, run.” And boy, did she. I thought he was kidding until he pointed out the sign I had walked past every night. I was heart-sick because there is no other place for Aggie to run in my small town. The Flower Market is not the same. Too many things obscure Aggie’s ability to flat out run. So, instead I walk her, and walk and walk and walk her. Early in the morning, late at night. We know all the roads, side roads, small alleys, shortcuts, where the streetlights are and aren’t. We walk and walk and walk. Its my small way of saying, I’m sorry. I didn’t know that cities have ordinances about dogs on leashes. I didn’t think about the number of cars traveling past my house every day that could pose a danger. I didn’t consider the number of hours I’d be at work and you’d be stuck in a crate. It never occurred to me that you would rely on me to pee. City dogs are a new concept for me. I want to tell her so she understands, I’m so sorry. I didn’t know you were made to run. 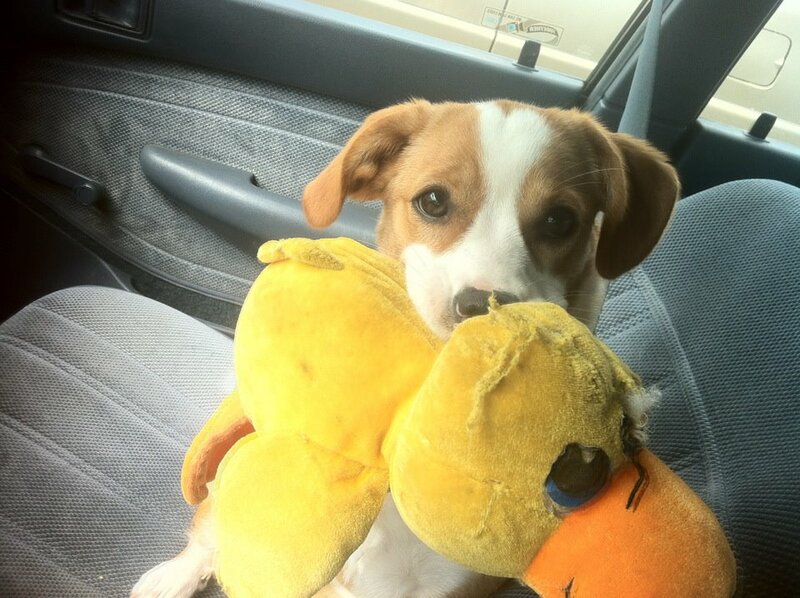 Aggie with her favorite and well-chewed duck.